Here is a delicious-healthful soup that will keep for a week in the fridge. 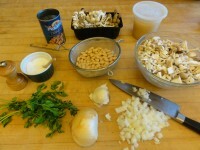 The best way to clean fresh or wild mushrooms is to wipe them with a damp cloth. Also, mushrooms are cooked enough when they are half wilted—if they keep cooking they will shrink considerably. To make the garlic croutons, place the bread, garlic, thyme, olive oil, salt and pepper on a baking tray and toss to combine. Cook for 8 to 10 minutes in a 400 degree oven or until crisp and golden. Set aside. 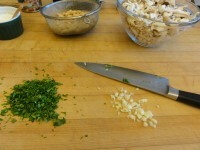 in the thyme, beans, the dried and fresh mushrooms. 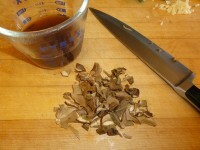 Pour in all but the last tablespoonful of the mushroom liquor with the stock, season with salt and pepper. Bring the soup to the boil. Reduce heat and cook for about 15 minutes. 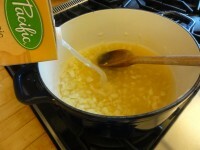 Stir in the cream and cook for a further one minute. 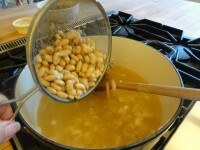 Using an immersion blender or food processor, blend until smooth. Add salt and pepper to taste.